Enjoy the most flexible WordPress blog Theme you’ve ever used. 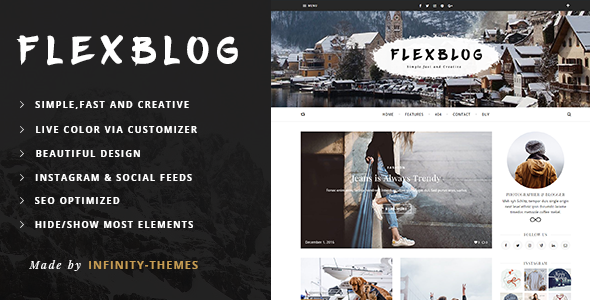 Flexblog will impress you with it’s simple, clean and modern design. It is really easy to use and ideal for WordPress beginners or even for advanced users. Fully responsive, fits any size of display from lower to higher resolutions and supports all modern browsers. Easily customizable with WordPress Live Theme Customizer. Flexblog gives you the power to customize your blog as you wish, in short time. The audience will be attracted by it’s creative and smart elements. The rest of functionality will ensure, that you get smart choice.